Laser skin tightening is a non-ablative, non-surgical way to firm the skin safely, comfortably, and without downtime. At Plastic Surgery & Dermatology of NYC, we offer excellent options for the most advanced laser skin tightening. The SkinTyte™ laser is non-invasive, working on the surface of the skin, while the minimally invasive SmartLipo™ laser is applied through a tiny incision beneath the skin. These laser skin tightening treatments use advanced light technology to deeply heat the skin and stimulate the remodeling of collagen, a key skin component that helps to provide structural support and firmness. This can result in progressive skin tightening and a more youthful appearance in the months following treatment. In addition to firming skin, laser skin tightening treatments can also improve the appearance of fine facial lines and wrinkles, enlarged pores, stretch marks, and mild to moderate acne scarring. Dr. Jody Levine is at the forefront of developing the latest technology and techniques in laser skin tightening, serving as a luminary for Sciton lasers. 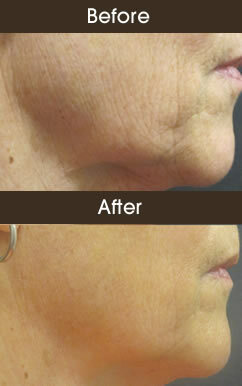 She has also lectured other physicians across the country on advanced laser skin tightening methodology. The laser skin tightening procedure uses laser light energy to deeply heat dermal collagen, causing partial denaturation and contraction (tightening) of the collagen fibers. The heat will also stimulate the body’s natural healing process, attracting fibroblasts (the body’s repair cells) to the area to lay down a new collagen foundation. Both of these changes can lead to increased skin firmness. During the SkinTyte™ procedure, powerful cooling maintains a comfortable temperature for the outer surface of the skin, protecting it while allowing the laser energy to work in the deeper dermis. The SmartLipo™ laser also includes advanced temperature monitoring, which pinpoints when the proper safe temperature has been reached to allow for optimal collagen production. What is the difference between SkinTyte™ and SmartLipo™? While both SkinTyte™ and SmartLipo™ are based on the principle of selective thermolysis to firm skin in targeted areas, there are differences in the way the lasers are used during treatment. SkinTyte™ is completely non-invasive. The SkinTyte™ laser is applied above the skin’s surface, utilizing pulsed light technology to deeply heat the skin while cooling and protecting the entire treated surface. SkinTyte™ can be performed quickly and comfortably with no anesthesia. The SmartLipo™ laser is placed beneath the skin through a tiny incision. For SmartLipo™, a local anesthetic is used to numb the treatment areas and ensure that patients remain comfortable during the procedure. Can the SmartLipo™ laser be used for skin tightening if I don’t need liposuction? Absolutely. SmartLipo™ technology is excellent for firming skin in targeted areas that would benefit from skin tightening but don’t necessarily require fat removal. 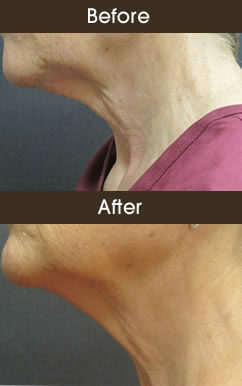 The neck and arms are popular treatment areas for SmartLipo™ skin tightening. While some fat is naturally reduced when treated by the laser heat, fat removal is not the primary goal when using SmartLipo™ for skin tightening. Of course, SmartLipo™ can also be used along with either traditional or laser liposuction in areas that need both fat removal as well as extra firming, such as the thighs, buttocks, and abdomen. What can be treated by laser skin tightening? Laser skin tightening treatments are safe for all skin types and can be performed on any area of the body where an improvement in skin firmness is desired. Popular treatment areas include the face, neck, abdomen, thighs, and arms. One of our most popular treatment areas is in firming the neck of patients who do not wish to have a surgical neck lift. Laser skin tightening can also help shrink dilated pores on the face, firm wrinkled abdominal skin that results after pregnancies, and smooth fine wrinkles around the mouth and eyes. Laser skin tightening treatments can also be used before, after, or in combination with other procedures to maximize results, including facelift or neck lift surgery, laser skin resurfacing, photofacial laser treatments, chemical peeling, BOTOX©, cosmetic injectables, liposuction, and microdermabrasion. When will I notice the results from laser skin tightening? Can laser skin tightening be combined with other procedures? Absolutely. Laser skin tightening treatments are often used in combination with other procedures to maximize results. For example, laser skin tightening may be used before or after facelift, neck lift, laser skin resurfacing, and laser photofacial to improve the skin’s appearance. SkinTyte™ is effective at firming skin after chemical peels, as well as after BOTOX® or filler injections. SmartLipo™ can be used along with traditional or laser liposuction to both tighten skin and remove fat. How many treatments will I need for SkinTyte™ laser skin tightening? For optimal rejuvenation, a series of 3 to 4 treatments spaced 1 to 4 weeks apart is usually recommended for most patients. * Dr. Levine will personalize your treatment plan based on the nature of the skin in the area being treated and the necessary level of improvement. She may also recommend combining SkinTyte™ with other popular aesthetic procedures to maximize your results. How many treatments will I need for SmartLipo™ laser skin tightening? 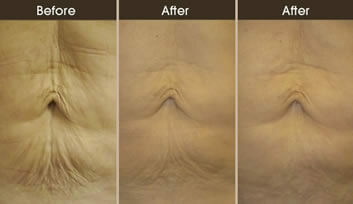 Skin tightening with SmartLipo™ requires only one treatment to achieve excellent, long-lasting results. * Dr. Levine may recommend combining SmartLipo™ with other aesthetic procedures for even greater rejuvenation. What should I expect during the laser skin tightening procedure? Both the SkinTyte™ and SmartLipo™ laser skin tightening procedures are performed on an outpatient basis in our offices. During the SkinTyte™ procedure, light energy is delivered in a sequence of rapid, gentle pulses to gradually and comfortably heat the treatment area. When the optimal temperature is reached to stimulate future collagen production, treatment moves on to the next targeted area. Dr. Levine uses the most advanced SkinTyte™ laser, which allows continual motion during treatment of multiple areas, resulting in shorter procedure times. There is no need for topical anesthetic during SkinTyte™ treatment. During the SmartLipo™ procedure, patients are given a local anesthetic to numb the treatment areas. A tiny incision is made to allow the laser to access the layers beneath the skin. The laser heats the underlying tissue, promoting collagen remodeling and skin tightening in the months following your procedure. What should I expect after the SkinTyte™ procedure? What should I expect after the SmartLipo™ procedure? Do you offer alternatives to laser skin tightening? Yes. We offer both FaceTite™ and BodyTite™ to achieve immediate skin contraction results. * These minimally invasive skin tightening procedures can firm lax skin around the face or body by delivering radio frequency energy to the underlying layers of skin. FaceTite™ can target the brows, cheeks, and jawline, while BodyTite™ can treat the breasts, arms, inner thighs, and abdomen. Dr. Levine can determine if either FaceTite™ or BodyTite™ are right for you during your laser skin tightening consultation. How can I find out more about laser skin tightening? Dr. Levine will be happy to meet with you to discuss laser skin tightening, including SkinTyte™ and SmartLipo™. Please call our office at 212-988-1800, or make an appointment online for a personal consultation in our New York City offices.